Painting portraits can be very challenging and rewarding – how to capture the spirits of the sitters, how to render the physiognomies and the postures faithfully yet with artists’s personal touches, how to connect the sitters to the viewers, and most importantly, to ensure the relevancy of painted portraits in the era of digital cameras and smartphones. One of my best portraits was a group of young men, me in the middle and two college friends at the two sides of the canvas. We sat on stone benches, looking serious and somewhat despondent, and aimed our eyes away from another, into different directions. It was a moment of uncertainty, a private consultation in a group setting, a dialogue with oneself, and a congregation without exchanges. I titled it “Interaction”. My relatively broad brushstrokes rendered the bushes in the background a hallucinatory backdrop, and the deliberately bland facial features were economically outlined – a kind of abstraction. I am quite proud of this work, as it captured the spirit of then Chinese collage students, who were facing very uncertain futures, in the age of political corruption and crackdown around the time of 1989 Tian’anmen (Tiananmen) Massacre and a very harsh economic future. 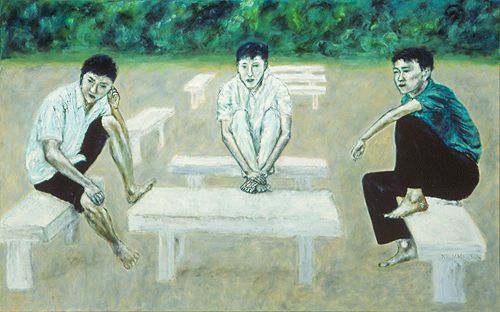 I just posted a blog on my trip to Beijing during the time the martial law was about to be declared in Beijing and the ordeals my fellow students and I endured during the sit-in on Tian’anmen Square, which will explain more of the background story to this painting, a souvenir of my youth: 25 Years Later, Smell of Exhausted Tian’anmen “Warriors” Lingered. This painting was selected for 23rd Annual National Juried Exhibition, Berkeley Art Center, July 23 – August 26, 2006.